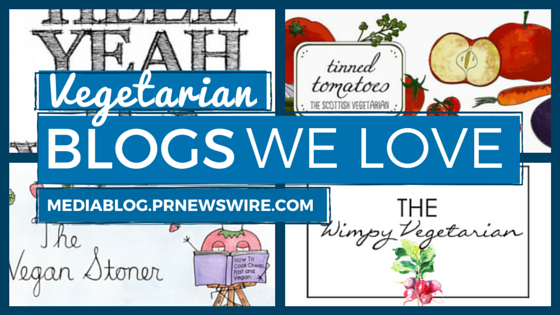 Did you know that Friday is Hug a Vegetarian Day? So, I’m handing out virtual hugs to all of these bloggers a few days early. The Tinned Tomatoes aka The Scottish Vegetarian is Jacqueline Meldrum, who writes and develops recipes with families in mind. She has been a vegetarian for 25 years but since her husband has gone vegan, many of her meals can be adapted. She and her young son still occasionally eat dairy. Although I’m not a vegetarian, I try to practice meatless Fridays and there is a ton of inspiration in her weekly Meat Free Monday meal planning. There are seven recipes, one for each day of the week, which means seven recipes for me to pick from for the week. I’m not always a fan of dairy, but I love pasta and the pictures in the recipe for Green Goddess Farfalle with Dairy Free Pesto look amazing! When I went searching for vegetarian bloggers I was not expecting to find Hell Yeah It’s Vegan. HYIV is a creative recipe blog with an environmental and human rights conscience. Besides sharing wonderful recipes with brilliant pictures, it also hits you with a history lesson. For instance, I was unaware of the banana company controversies that may be improving since the companies’ dirty laundry came out. Not only did I learn about these companies, but I have a new banana bread recipe to try using organic, fair trade bananas. Since pumpkin recipes are everywhere this time of year, I find its pumpkin puree recipe a real life saver for all the recipes I plan on making this fall. My daughter and I love tomatoes so much that we eat them off the vines in our container garden which is why tomato pie appeals to me – tomatoes and cheese in a pie! Sticking with the tomato theme, I found her zucchini noodle, tomato, and Asiago cheese dish something the whole family would love and for dessert pumpkin-coconut cookies. Sarah Conrique and Graham I. Haynes are the master chefs behind The Vegan Stoner. They are the brains behind the recipes, illustrations, and the book The Vegan Stoner Cookbook. They started the blog to show that eating vegan does not mean an extensive grocery list or that it has to be complicated. It is so hard for me to pick some favorites because I’ve absolutely enjoyed scrolling through this blog. Besides gorgeous photos of food, they have created wonderful illustrations instead of the standard list of ingredients. If I had to pick two I would pick the Teriyaki Skewers and Strawberry Cheesecake. P.S. Ever wonder how we come up with ideas for our blog profiles? Our handy list of industries and subjects on PR Newswire for Journalists stays top of mind. If you’re a blogger or journalist looking for food and beverage news, let us know. We can customize a newsfeed for you on PR Newswire for Journalists. Mary Johnson is the office manager in the PR Newswire Cleveland office. You can find her blogging at ineedaplaydate.com or oversharing on Instagram. Follow her on Twitter at @mryjhnsn.